This mug is a gift from the Perez-Lavin family, my "adoptive family" here in the US. I am a fourth year PhD student in Mathematics. My advisor is Uwe Nagel and my research interests lie in the field of Algebraic Statistics. Algebraic Statistics is useful for analysis of data when traditional statistical methods fail. In particular, the main project I am working on is about hierarchical models and their corresponding toric ideals. 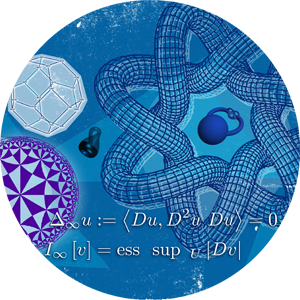 I study algebraic and geometric properties of these models, and algorithms that produce Markov bases for them. We are enjoying working on equivariant Hilbert series these days. I would love to talk with you about any type of statistical model, and discuss together how to use the Algebra machinery to think differently about these models. Additionally, I am trying to be better at making technology my friend. So, we can talk about Macaulay2, 4ti2, Sage, R, Python. Just stop by my office or send me an email! Fall 2018: Matrix Algebra and Its Applications (MA 322), Course Assistant (two sections). Spring 2018: Calculus I (MA 113), Workshop Leader (Math Excel Program). Fall 2017: Calculus I (MA 113), Workshop Leader (Math Excel Program). Summer 2017: Calculus III (MA 213), Primary Instructor (one section). Spring 2017: Calculus I for Life Science Applications (MA 137), Recitation Leader (two sections). Fall 2016: Calculus II (MA 114), Recitation Leader (two sections). Summer 2016: Calculus II (MA 114), Primary Instructor (one section). Spring 2016: Calculus II (MA 114), Recitation Leader (two sections). Fall 2015 (MA 110): Algebra and Trigonometry for Calculus, Recitation Leader (two sections). **Math Excel is an intensive problem-solving approach to the standard calculus sequence. Equivariant Hilbert Series and Krull dimension arising from Hierarchical Models. Joint work with Uwe Nagel (in progress). Generating sets for Hierarchical Models up to Symmetric Group Action. Joint work with Uwe Nagel (in progress).